The adjective ‘solemn’ finds itself attached to so many events, usually inappropriately, but occasionally a moment arises when only that word applies. This morning definitely presented one such situation, the acceptance of the resignation of Father Adolfo Nicolás, our Superior General. For me, the moment eclipsed even the moving and beautiful opening liturgy last evening, led by Fr. Bruno Cadoré, the Master General of the Dominicans. The day began simply enough. After prayer invoking the Holy Spirit, we engaged the intricacies of opening the General Congregation. This session was made the more ‘interesting’ by a variety of technical problems that almost necessarily occur in the first use of new tablets by a group of more than 200 people. For all our education, we can still be ‘technologically challenged’. Thank God good humor abounded as we waited for technicians to make things right. The transformed Aula where we gathered helped set a positive mood. In short order, we declared the Congregation open and valid. The mood shifted, however, as we entered into a truly historic moment, the consideration of the request of Fr. Nicolás to resign, only the third time a Congregation has had to consider this possibility. The General spoke from the heart of his reasons for wanting to resign, all rooted in his desire to serve the Society of Jesus and the Church, to ensure that the Society of Jesus would receive the vigorous leadership it needs and deserves. After a brief report from one of the four Jesuits charged with caring for the good of Fr. General and the Society, the so-called Assistants ad providentiam, all of us prayerfully discerned whether to approve the request, to vote placet (yes) on non placet. The room was silent, and then, one by one, we approached a large wooden ballot box, there to deposit our ballots. Not often does one see Jesuits so aware that this is a ‘matter of greater moment’, but then there was no talking, only an appreciation of all this moment meant. The votes were counted and then read out, with us having voted to approve Fr. Nicolás request. Back into the Aula he came, there to receive the news, but also our deep gratitude and reverence, expressed in four heart-felt and prolonged standing ovations. 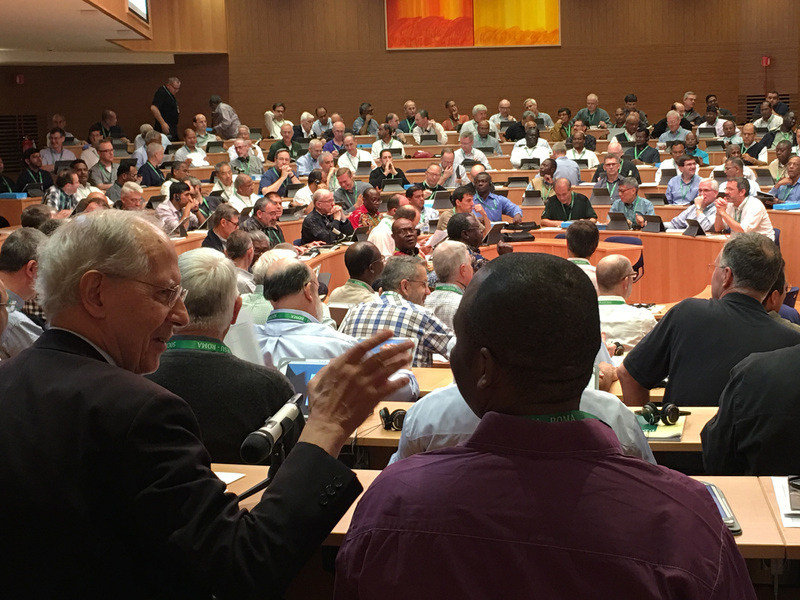 It was, as one delegate noted, one of the most powerful expressions of fraternal love and respect we’d ever seen, something we wish all our brothers had experienced. It fell to Fr. Federico Lombardi, one of the Assistants ad Providentiam, and formerly the Pope’s Press Secretary, to express our appreciation. He did a masterful job, speaking of the many ways in which Fr. Nicolás has served us so well. He recounted so many achievements, the many ways in which Fr. Nicolás had lived out what Fr. Cadoré called us to last evening, ‘the audacity of risking the improbable’. During eight years as General, he had challenged all mediocrity among his brothers, calling us to depth and a more universal vision of our mission to serve our Creator and Lord. He had forged warm links with both Pope Benedict and Pope Francis, no small task in the latter case given that he is the first Jesuit Pope. Through all that time, as Fr. Lombardi noted, with all the difficulties he had to handle, he always led in a personable, warm, joyful, compassionate way, never having a sad or angry face. A worthy successor to St. Ignatius. He now returns ‘to the ranks’, ready to head back to the Philippines as missioned by his provincial. Still, the warm applause that greeted him even at lunch shows that he will always find himself surrounded by the love, respect, and gratitude of his brothers – and of so many others. One must describe this morning as ‘solemn’, but not heavy. On the contrary the solemnity only revealed to us in the Aula – as if it needed to be revealed – the ways in which he has touched our lives, our ministry, our future. Solemnity can indeed move and express the heart, and so it did this morning.